You may be a good candidate for a dental implant if you are in good general and oral health, especially if you have healthy gum tissues free of periodontal disease and other dental problems. This is because tooth implants require adequate bone in the jaw to support them. Dr. Desiree Yazdan and her team are able to diagnosis and perform treatment of gum disease, and placement of dental implants. Dr. Yazdan has received extensive training and has the special knowledge, equipment and facilities needed to create and place artificial teeth that look and feel just like your own. Newport Beach cosmetic dentist Dr. Yazdan agrees that the best candidates for dental implants are those in good oral health, with healthy gum tissue, free from periodontal disease, and sufficient underlying bone. Contact our office to know if you qualify as a candidate for dental implants. Dental implants combine both restorative and cosmetic dentistry. Dental implants replace one or more missing teeth or secure a dental bridge or denture with stability similar to a natural tooth root. If you are in good general oral health but have lost teeth due to injury, periodontal disease, or some other reason dental implants artificial tooth roots placed in the jaw to hold a replacement tooth may be a great option for you. Replacing missing teeth with dental implants preserves the bone mass and strength. With sedation dentistry, dental implants are now virtually painless. Besides the obvious reasons like difficulty chewing or bite misalignment, your confidence about your teeth and smile affects how you feel about yourself and your everyday life. Dental implants can look and feel just like your own, natural teeth. An implant consists of an artificial tooth root placed by a certified periodontist into your jaw to hold a replacement tooth. With proper care, dental implants can last a lifetime. If you are tired of wearing dentures or removable bridges, a more permanent option is available – dental implants. In Newport Beach, Desiree Yazdan D.D.S. is a cosmetic dentist who has gained a positive reputation for her work with implants. If you would like to receive dental implants in the Newport Beach, CA area, you can consult Dr. Yazdan to learn of your options in cosmetic dentistry. A dental implant restoration consists of a bio-compatible titanium screw and post topped by a dental crown, bridge or dentures. The dental implant is surgically placed into the jawbone where it replaces the natural tooth root. In a few months, the dental implant securely attaches to the bone (called osseointegration), allowing it to withstand biting and chewing forces just like a healthy, natural tooth. Depending on your needs and condition, dental implants can replace one or more teeth without affecting bordering teeth, as well as provide support for a bridge, eliminating the need for a removable partial denture. Dentals implants create the illusion of natural-looking teeth that function and feel like real teeth. Dr. Yazdan can use dental implants to replace one or more teeth. Even if you are missing most or all of your teeth, these tooth fixtures can provide a healthy bite and smile. The majority of patients have had dentures or removable bridges to compensate for missing teeth, but find them to be loose and unstable. Dental implants are a permanent option to filling in gaps and replacing missing teeth. Dental implants will not only help your teeth function better they will improve your overall facial appearance. In turn, your smile will look fantastic! To determine the appropriate site for the dental implant placement, Dr. Yazdan typically takes x-rays. Sometimes CT scans may be prescribed as well. Impressions are taken of the mouth and then used by the dental laboratory to create a customized dental implant restoration. Many dental implant dentists fabricate surgical guides to simplify the placement of the dental implants. At the second surgical appointment, the Periodontist makes an incision to expose the bone at the dental implant site. The Periodontist then prepares the site to receive the dental implant. Once the dental implant is secured, the gum tissue is sutured back over the dental implant. 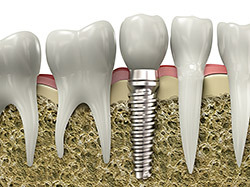 The dental implant is left undisturbed for three to six months to allow it to osseointegrate with the bone. If the dental implant is in a visible area of the mouth a temporary will be fabricated to replace the edentulous area. Once the dental implants have been completely integrated with the bone, a post is attached to each dental implant. Dr. Desiree Yazdan then uses her cosmetic dental expertise to create the permanent tooth replacement. Dental implant aesthetics are unmatched, with their ability to look and feel like natural teeth. No one will ever know that you have a replacement tooth. Dental implants can save your teeth by integrating into the bone structure instead of relying on the bordering teeth for support, thereby preventing the bone loss and gum recession that can be caused by dental bridges and dentures. Dental implants boost confidence allowing you to eat and speak worry-free and with comfort. They eliminate any maintenance and embarrassment that can accompany dentures. Dental implants are durable, reliable and effective, with years of clinical experience and predictable success rates. Dental implants are able to not only replace one or more teeth without affecting any other teeth, but they can also provide support for bridges and dentures, or help patients avoid removable dentures altogether. Each implant holds one or more prosthetic teeth. If you are missing most or all of your teeth, an implant-supported full bridge or full denture can replace them. Dental implants will replace both your lost natural teeth and some of the roots. If you don’t have enough bone to support a full mouth restoration with dental implants, Dr. Yazdan may recommend bone graft and tissue regeneration. In this case, the bone usually will be allowed to develop for about four months to a year before implants can be placed. First, the titanium implant (it looks like a screw or cylinder) is placed into your jaw. It takes about two to six months for the implant and the bone to fuse together to provide a solid foundation for your artificial tooth. Dr. Yazdan may offer you a temporary tooth replacement for this phase. In some cases, Dr. Yazdan will perform a second procedure to attach an extension called abutment a small metal post that fits over the portion of the implant above the gum line and completes the foundation for the new tooth. You will need to recover for one or two weeks after this procedure. Finally, Dr. Yazdan will fabricate a replacement tooth (a crown) and attach it to the implant foundation. What About Maintenance Of My Dental Implants? Just like with your own, natural teeth, you will need to take good care of your dental implants for the rest of your life, including regular brushing, flossing and at least two visits per year to Dr. Desiree Yazdan’s Newport Beach office. Dr. Yazdan and her team will work closely with you to develop the best care plan for you. Dental implantation cost in our Newport Beach office will vary depending on your individual case. In general, dental implants are not covered by dental insurance. In some cases, coverage under your medical plan may be possible, and Dr. Yazdan can help you determine your payment options.